FLORHAM PARK, NJ (April 10, 2017) – Today, Gerber Products Company announced that they are now featuring the exclusive Smart Flow™ spout across both Organic and Grabbers® pouches. The Smart Flow™ technology was developed following consumer research that found moms wanted a pouch that could help in reducing mess so the food gets into their little ones’ tummies and not everywhere else. The Smart Flow™ spout’s opening is customized based on what’s inside, so it helps provide the appropriate amount per squeeze. Also, because many of those hungry and excited little ones are feeding themselves, Gerber introduced soft sides and rounded edges that are gentle on their mouths and hands. Over the last five years, pouches have been a steady growth driver for the infant food category, becoming a staple item for moms and their babies. Gerber’s new Smart Flow™ pouch began to appear on shelves at the end of 2016 with most major retailers having it available in stores now. 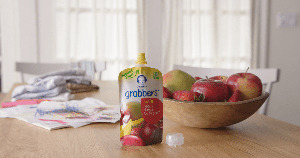 To kick off the launch, Gerber is releasing a new, integrated advertising campaign called "#PouchWin.” The campaign features toddlers in a series of real life moments that all moms can relate to – when that convenient pouch suddenly becomes an inconvenient mess, or what Gerber calls a #PouchFail. But, with the new Smart Flow™ spout, #PouchFails turn into #PouchWins, getting nutrition in toddlers, not on them. For more information, including all the flavors and benefits of the new and exclusive Smart Flow™ pouches, visit gerber.com/smartflow.